Many new Christians have the idea: “Now that I am saved, all my problems are over.” Nothing could be farther than the truth. Satan hates to see anyone saved, and he has now become your enemy. He wants to defeat you spiritually and keep you from being a witness for the Lord Jesus Christ. These are big dangers in your Christian life. Every Christian must recognize the dangers he will face, and then he will know better how to meet them. It is like traveling on an unfamiliar road and being warned of washouts, detours, and roadblocks. So there are certain obstacles, dangers, and pitfalls which can cause a new Christian to be hindered in his growth in this new life. God wants us ready to face the dangers. John Bunyan, in his Pilgrim’s Progress, tells of showing Christian the “armoury” and the equipment to stand against danger. Many times this truth seems a strange truth to new Christians. Why would anyone want to persecute someone who wants to live for the Lord and do right? It does sound strange, does it not? But the fact is, that is exactly what will happen. Because you decide to live godly, there will be those who will do all in their power to harass you. After one is saved there are those who will mock and make fun of the new convert. Sometimes it is a family, or it may be friends, or it can be associates at work. They watch the new Christian and endeavor to discourage him by making fun of him. Don’t ever let this discourage you. Derision of a Christian is to be expected. Jesus promised that believers would face persecution. Then immediately after announcing these seven blessings, He adds, “Blessed are they which are persecuted for righteousness’ sake: for theirs is the kingdom of heaven” (v. 10). The Lord is saying that the person who walks with Him and receives the first seven blessings can be sure there will be persecution. These blessings are entirely different from anything the world knows. The world would never say, “Blessed are the poor in spirit.” Neither would the world say, “Blessed are they that mourn.” This philosophy is cross-grained to anything the world offers. Therefore, the believer can expect to encounter some persecution because he is living exactly to the world’s ideology and philosophy. The early church experienced persecution. So, you see, the Bible teaches that persecution can be expected in the life of a believer. Often such persecution comes because of ignorance or lack of understanding. The Christian should not allow such persecution to discourage or defeat him. It will be a normal thing for the unsaved of the world not to understand and to put pressure on us for our faith. The early church faced great trial and persecution with rejoicing, blessing and victory. 1. Have love and understanding. 2. Have a definite concern and burden for them because of their lost condition and their inability to understand. 3. Pray for yourself that you will use good wisdom in the way you treat them and handle the situation. 4. Pray for them with wisdom and concern fore their spiritual condition. You face an expert enemy. The Bible teaches there is a personal devil who will do all in his power to defeat us. He will attack us, and he longs to have victory over us. He may come as a roaring lion, or he may come as an angel of light. When he comes as an angel of light, Satan is using his lying technique to deceive. God’s Word says he is the father of lies. 1. The god of this world. As the god of this world, Satan does all in his power to keep folks from hearing and believing the Gospel for salvation. He endeavored to keep you from being saved and will do the same for others. 2. The resister who will fight the believer. This verse presents Satan as a cunning fighter, using every technique he can find to defeat the believer. 3. The adversary who accuses the brethren. 4. The enemy that opposes all that is of God. 5. The tempter that lures us to sin. Satan will trouble us as long as we live. He works on our minds to influence us. This is the reason we need to have “the renewing” of our minds as mentioned in Romans 12:2. To have victory, we must have our minds under the control of the Lord. Philippians 4:8 is a good rule for us so that we can have mind control. RESIST! That means to say, “NO!” We can resist him only if we submit to God. We say “NO!” to the devil in the power of the Lord. The idea of resisting is to withstand or stand against. The Greek word for resist is the word from which we get our word antihistamine. An individual has a cold with watering eyes and running nose. He takes a dose of antihistamine. That drug stands against the cold, dries up the tissue, and does not allow the cold to be in control. So it is with us as we meet the devil. We must stand against his attacks. In any possible temptation or problem we should ask, “Will this please God, or will it please Satan?” In every case, Satan’s will is opposite the will of God. Therefore, no born-again child of God should have any question. He should not want to please Satan. We must live to please God and to bring glory to His name. Years ago, as a new Christian, I took this as my life verse. If we obey this verse, our problems will be solved concerning Satan’s attacks. You must face a sinful world. 1. Command believers not to love the world. 2. State that if a believer loves the world, he does not have the love of the Father in him. 3. Reveal that the “world” is the world system. 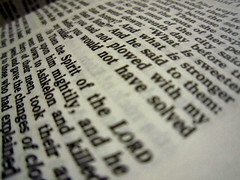 The world of which the Bible speaks is not the created world. It is the system of the world that is contrary to the Word of God. This world system is the enemy of the Christian. Therefore, you can know that the world system is designed to defeat you in your Christian life. This world makes great demands upon our time and energy. It will get us involved in making money, striving for success, seeking for comfort and security. When these become our chief interests, we will not be happy, victorious, fruitful Christians. You face decisions in your Christian life. Today strange things are taking place in the so-called Christian world. There are those who claim to be saved but who go right on living as the world lives. For example, there are certain individuals today who are played up as outstanding Christians, but who play in night clubs on Saturday night and preach in churches on Sunday. Recently, I saw a picture of a well-known sports figure who claims widely to be a Christian; and in the picture, it showed him drinking beer. Later I read in the newspaper that he was being tried for a case of drunken driving. This type of Christianity is alien to the Word of God. a. Not using foul language. b. Not reading pornographic material. c. Not participating in, telling, or listening to sensuous, filthy jokes. d. Not attending Hollywood movies. e. Not using alcoholic beverages of any kind. f. Not hurting the body by smoking or the use of drugs. The above is by no means a complete list. You need to determine that whatever you do will be done to glorify God (I Corinthians 10:31). a. Be careful about your companions. They will have a great influence on you. b. Be careful about lifting people above the Lord. Many times new Christians begin to exalt certain individuals in their thinking. A believer can make a mistake by putting even a good Christian on a pedestal and beginning to look at that individual as a model. You must remember, however, that even the best Christian still has a fleshly nature. He may stumble and fall and really disappoint you. If you will determine you are going to look only to Jesus, you will find much greater victory in your life. You face an enemy within — the flesh. The “flesh” is that sinful nature that remains with the believer. A child of God has a new nature through the new birth. But he still has the old flesh nature. In Galatians 5:19-21 Paul identifies the works of the flesh, and in verses 22 and 23 he identifies the fruit of the Spirit. You and I need to pray and long for the fruit of the Spirit to be manifested in our lives. That fruit is nine-fold: love, joy, peace, longsuffering, gentleness, goodness, faith, meekness, temperance. 1. Our inner man — love, joy, peace. 2. Our relationship to others — longsuffering, gentleness, goodness. 3. Our relationship to God — faith, meakness, temperance. Galatians 5:16 instructs us that if we will walk in the Spirit, with this fruit of the Spirit being manifested in our lives, we will not fulfill the lust of the flesh. We need to recognize that one of the biggest enemies we face is ourselves and our fleshly desires. You will meet trials that will test you. Some new Christians have the idea that when a person accepts Christ, he will not have any more problems. Oh, no! The devil, the world, and the flesh are still active. They will do what they can to stop a believer. Trials, testing, and tribulations will come. 1. Realize that God has not forsaken you. He permits testings to come in any life. These testings are to be used to make us stronger. Remember: Trials should make us better, not bitter. 2. Recognize that God has a purpose in the testings. 3. Rest in the Lord.